A pilot project was carried out to prove the efficacy and enormous strength of EarthZyme® roads to facilitate the use of heavy trucks. These trucks are required in the mining, logging and oil operations around the globe. This specific road stabilization project was on a mine haul road in one of the largest coal mines in Colombia. This operation produces nearly two million tons of coal per year, maintaining a sterile standard ratio of 6 to 1. The mine mobilizes approximately 15 million cubic meters per year using CAT 793 trucks with a capacity of 380 tons. 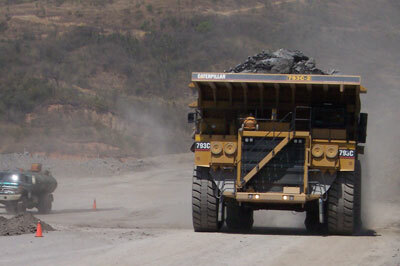 It also employs smaller CAT 777 trucks with a capacity of 140 tons. All coal at this mine moves in double truck lanes with a traffic gross weight of 32 tons. These trucks travel on the road approximately 22 hours a day, maintaining a frequency of one CAT 793 every 5 minutes and 1.3 CAT 777 every 5 minutes. EarthZyme® effectively provided road stabilization for these mine haul roads. This enabled the ongoing operations of the mine, which increased productivity while decreasing downtime. Mines tend to be located in some of the world’s most isolated locations. Their haul roads are required to withstand heavy and continuous traffic, often over very large distances. Road stabilization is extremely important to keep the mining activities going. This huge mine represents 20% of the coal output of the entire country of Colombia. This is exceptionally good news for all heavy industries that require strong reliable roads that are also friendly to the environment. It also has led to an air express shipment of Dust Stop®, since any dust evident in the photo comes from the minerals in the truck. All trucks are now coated with Dust Stop® because it prevents the dispersion of the hazardous particulate matter. New laws will soon regulate the treatment for dust not just in haulage, but also on all mined areas and to ensure the safety of the mine workers who must breathe in the dangerous particulate matter in the air that cause so many serious illnesses occurring so often in hazardous dust environments such as these.